Indian producers were not among the first in the 3D printers market, but now they have created a rather competitive 3D printer at once. CreatorBot founders have focused on the weight of the machine and its price. Instead of bulky and heavy competitors, CreatorBot 3D printer is ultra-light, only 3.5 kgs and can be easily carried. What’s more inspiring, the cost of the model is around $470, which is rather available. Power: 12v 5A Power adapter (included). 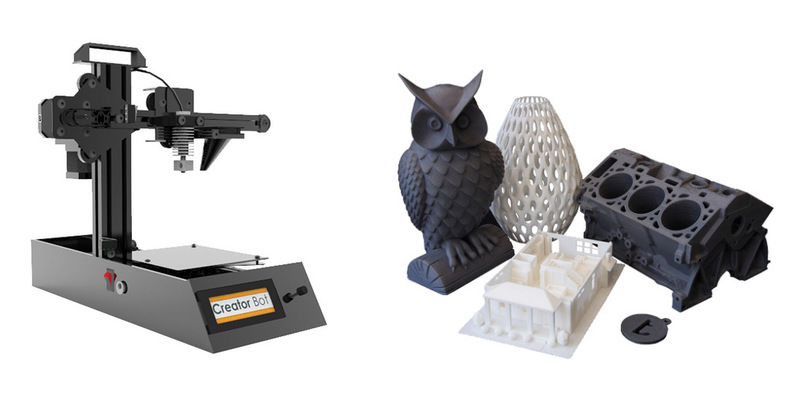 Moreover, three types of materials can be used in the CreatorBot 3D printer, they are PLA, Nylon, ABS with heated bed. And the model features printing through SD Card and is equipped with a Multifunctional Graphic LCD Controller. The purchase of the gadget and its parts can be made online. As well as the support is also online available to all the users. According to the developers, it’s a budget printer “for a hobbyist or an enthusiast”, though producing decent quality objects. This entry was posted on Tuesday, September 23rd, 2014 at 1:31 am	and is filed under 3D, printer. "New Canon Maxify Inkjet Printers For Small Business Owners"